The Oregon State University (OSU) Education Hall (ED Hall to those at OSU) in Corvallis, OR “was built as a symbol of permanence” and was dedicated on October 15, 1902. The exterior of the building was originally clad in locally available Diorite (mistakenly called “Dark Granite in most OSU publications) at the first floor from the Cascade Mountains and sandstone at the second and third floors from the Pioneer quarry in Lincoln County Oregon. The Diorite quarry information is unknown, however, based on the findings during demolition the material was hauled to the project site as blocks and fabricated on site. The sandstone material was quarried and fabricated in Lincoln County which is located to the West of Corvallis. The quarry is no longer active and very little information exists about it. ED Hall has survived many challenges during its 109 year use. The wood framed structure was completely burned out not once but twice eventually replaced with concrete structure in 1930’s. This reconstruction work was done in a fashion that did not allow the interior structure to be connected to the exterior stone skin. Over the years the building suffered further damage due to seismic events which caused the exterior stone skin to fail and pieces or parts of pieces began to fall from the building. 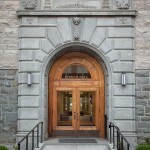 In an effort to maintain the building as a teaching facility for the university two (2) temporary covered entries were constructed at the East and West entries. At some point a minimum of four (4) different types of paint or coatings were used on the sand stone to help prevent pieces from coming lose and falling to the ground. When this proved unsuccessful the building was wrapped in chain link fencing to keep any stone pieces/parts from falling to the ground or at least controlling how they fell. The building was deemed structurally unsound and no longer used by OSU and had loomed in the realm of irrelevance with a very uncertain future. In 2008 OSU began a very aggressive fund raising effort to raise the funds necessary to bring ED Hall back to the iconic status it once held on campus. This effort would include accurately reconstructing the building to its original state and to current seismic codes. As part of this effort Columbia Stone, Inc., more accurately the owner Michael Twiss was brought onto the project originally as a consultant. The consulting efforts lasted two years and in that time the selection of a material that would closely match the unavailable original sandstone was made. 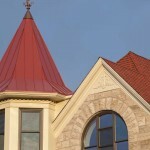 As well as the restoration efforts and the seismic upgrades necessary to the stone and cast stone portions of the original building that would remain. IN 2010 CSI was awarded the stone scope for this project and planning began immediately on how to accurately document the existing stone as to reinstall the new stone in the exact same location. With the chain link fencing and other unnecessary items removed from the exterior Cole Surveying (Corvallis, OR) was brought on board to provide a laser mapping of the exterior stone façade. This mapping included several million points of reference that were then turned into a model of the building. From this model CSI was able to prepare shop drawings that would place the new material in the exact same location as the original. With the model complete the demolition began and with it many discoveries that would challenge the team. The first floor Diorite was to stay intact and receive seismic reinforcement from drilled and epoxied threaded rods attached to metal stud framing. During demolition it was discovered that the Diorite varied in size from small blocks (3’x4’x18”) to ruble that appeared to be left over from sizing the larger pieces. A new plan was devised to place the over 500 threaded rods, install a rebar cage and apply an 18” thick gunite wall over the back and a 3’-0” tall beam over the existing Diorite. With the first floor seismically stabilized the work commenced on the upper floors installing new CMU shear walls, metal stud framing , Dens Glass and waterproofing for the new sand stone to be installed over. Stone installation commenced on July 2011 with the largest of the new stone pieces the “belt course”. The largest of the pieces weighing over 3,000 lbs and supported by galvanized angle and the first floor Diorite. 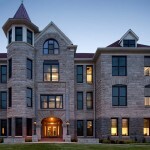 The exterior limestone skin included multiple course heights and varying lengths to replicate the original sandstone as well as specific corner pieces for building corners and each window type. This scope required over 300 individual stone pieces and due to the thicknesses ranging from 6” to 25” the overall stone weight for the project was in excess of 1,000,000 pounds. The new limestone jointing detail, 5/8” radius “rope”, was scrutinized heavily by the architect and university to ensure its accuracy to the original. 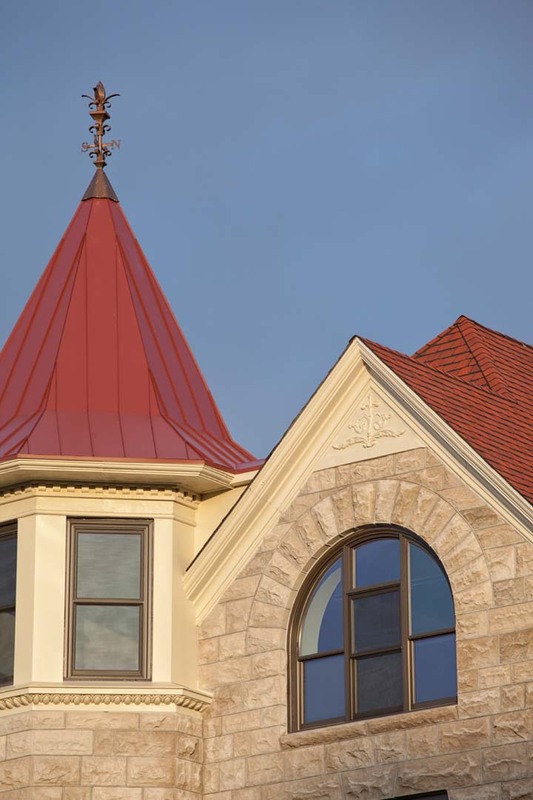 In conjunction CSI replaced approximately 2,000 LF of jointing at the existing Diorite and the restoration of two existing entries that had roofing material applied to them with the temporary overhead protection. A very challenging effort of the restoration scope was the recreation of a 100 year old rosette on the east entry. One of the original two rosettes remained and CSI sought the help of MIA member and Portland area stone carver Peter Andrusko to recreate the rosette. The team was amazed at the accuracy of the reproduction and concluded the restoration effort to be a complete success. In an effort to maintain some of the original sandstone CSI commissioned MIA Accredited member Natural Stone Designs to reclaim a portion of sandstone and create new cladding for two (2) light pole bases and two (2) benches for the east entry. 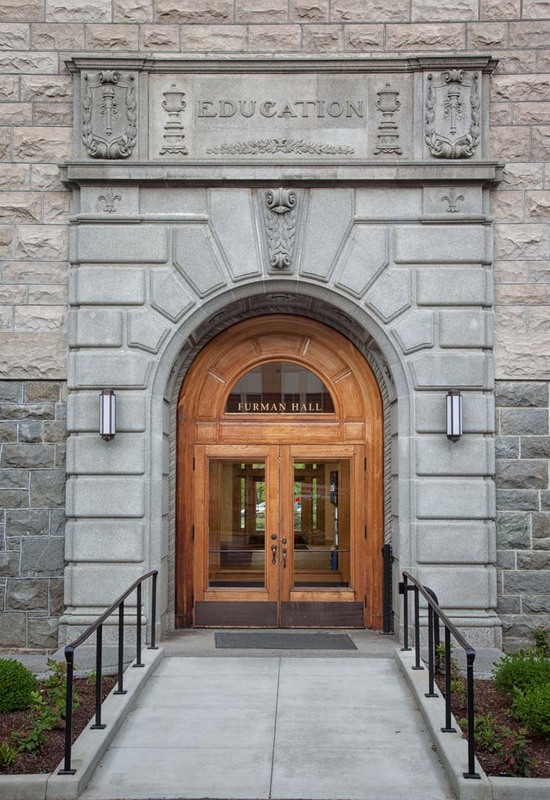 With the tireless effort of many people, a university that is dedicated to preserving its history and great craftsmen ED Hall, now renamed Furman Hall, will offer another hundred years of service to one of Oregon’s great universities. 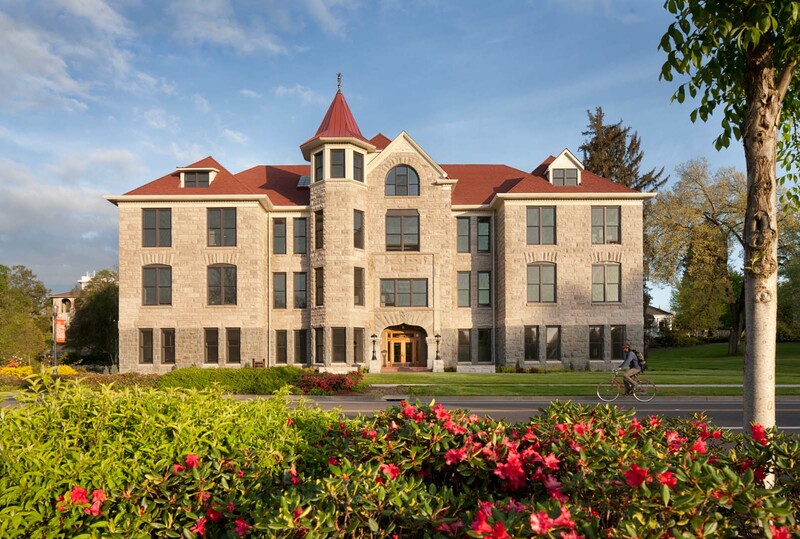 Fortis has been honored with a DeMuro Award by Restore Oregon for the Oregon State University Furman Hall project. The DeMuro Award celebrates the best preservation, adaptive reuse, and community revitalization projects in Oregon, and 2013 was the first year DeMuro Awards were bestowed on projects. The award is named in honor of Art DeMuro—the late developer and president of Venerable Properties. 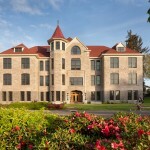 Furman Hall (1902), Corvallis – rehabilitated for Oregon State University School of Education (2011). Transformed a beloved-but-obsolete building in OSU’s historic district that was literally falling apart. 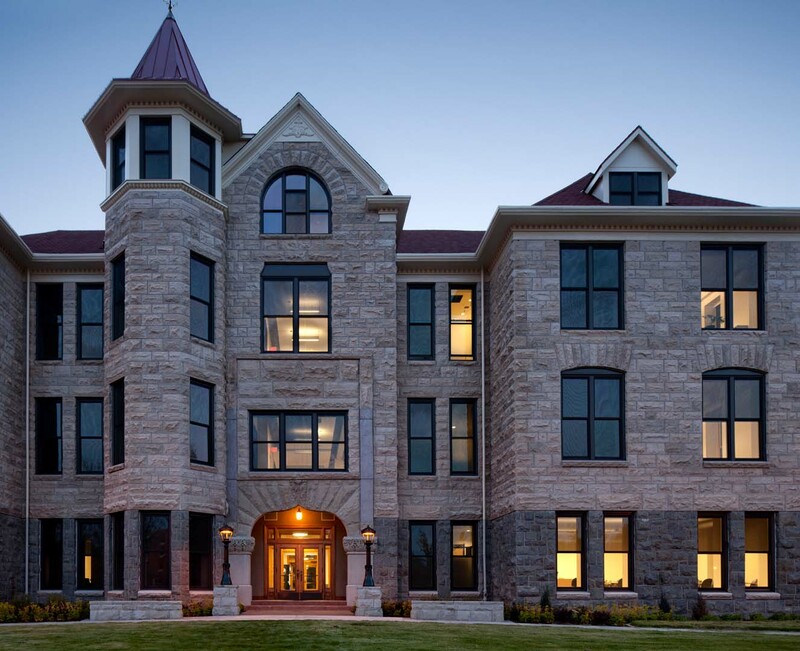 Seismically unsound and wrapped in netting to protect pedestrians from crumbling sandstone, Furman Hall was structurally rebuilt, its interior redesigned, and sandstone façade replaced in kind. Congratulations to the project team of Jerry Aguinaga, Rene Gonzalez, Neil McEachin, Geoff Miller, Carlos Montero, Matt Norman, Kean Rager, Demetra Star, Tim Sissel, Luke Stillar, and all the others that contributed to the project. This entry was posted in Education on November 3, 2014 .